Context: Obesity is considered as one of the risk indicators of periodontal diseases. Resistin could be one such marker that could provide a link among the periodontitis-obesity. Aims: The aim of this study was to corelate the serum and saliva resistin levels and its association in obese individuals with chronic periodontitis. Settings and Design: A cross-sectional study was done to co-relate the serum and saliva resistin levels and its association in obese individuals with chronic periodontitis. Subjects and Methods: Participants were divided into Group I comprising 15 obese individuals with healthy gingiva (control group) and Group II comprising 15 obese individuals with chronic moderate periodontitis (periodontitis group).Gingival index, clinical attachment level and body mass index were determined. Enzyme-linked immunosorbent assay test was used to determine the level of resistin in both serum and saliva. Statistical Analysis Used: To study the difference in the levels of resistin between two groups in terms of saliva and serum, independent sample t-test was used. Results: The highest resistin levels were seen in the serum and saliva of Group II. Correlation of serum resistin concentration with salivary resistin concentration was positive among both the groups. A positive corelation was observed between resistin and clinical parameters and was statistically significant. Conclusion: Thus, resistin can be considered as a potential mediator linking obesity and periodontal disease. Hence, it can be concluded that resistin probably may bear similar features of a proinflammatory cytokine and could play a role in inflammatory diseases like periodontitis. Periodontitis is a chronic inflammatory disease caused by a Gram-negative anaerobic microorganisms, leading to soft tissue destruction and loss of alveolar bone characterized by stimulation of host inflammatory system which causes the production of proinflammatory mediators such as interleukin-6 (IL-6) and tumor necrosis factor alpha (TNF-α)., Along with the microbial plaque, there are various risk factors such as smoking, stress and systemic conditions that can cause periodontitis. Periodontitis has been linked to systemic conditions, including heart disease, diabetes, obesity, and metabolic syndrome. The association between periodontal diseases and these systemic conditions seems to be attributable to a low-grade inflammatory burden that links them through a common pathophysiologic mechanism. Periodontal disease affects both glucose and lipid metabolism that may be important factors in the development of both Type 2 diabetes and cardiovascular disease. A three-way relationship has been established between obesity, diabetes and periodontitis as shown in [Figure 1]. Obesity is defined as abnormal or excessive fat accumulation that represents a risk to general health. Obesity causes insulin resistance by the mechanism that enlarged adipose tissues mass is thought to influence insulin action by secretion of adipokines such as resistin, TNF, IL-6, visfatin, and adiponectin. Obesity is characterized by the presence of chronic subclinical inflammation with increased concentration of the above-mentioned proinflammatory mediators. Obesity, diabetes, and chronic periodontitis are related to each other and obese subjects are at increased risk for diabetes, as well as chronic periodontitis, thereby exhibiting a triangular relationship among the three conditions and resistin may act as a connecting molecular link between these conditions. Being overweight and obese are considered to be the important risk factors for various adult diseases, including Type 2 diabetes, hyperlipidemia, hypertension, cholelithiasis, atherosclerosis, cardiovascular, and cerebrovascular disease. Recently, obesity has emerged as one of the risk indicators of periodontal disease. Resistin or "resistance to insulin" is adipocyte-derived signaling polypeptide discovered in mice in 2001 and is named after its proposed function of resisting insulin, belonging to a family of resistin-like molecules with distinct expression patterns., Resistin could be one of the molecular links connecting obesity, periodontitis, and diabetes and may serve as a marker that links periodontal disease with other systemic diseases. Human resistin also acts as a proinflammatory molecule and stimulates the synthesis and secretion of proinflammatory cytokines - TNF-α, IL-6, IL-12 and monocyte chemoattractant protein-1. With the advancements in the technologies for the early detection, intervention, and prompt treatment of diseases, there is a growing scope for finding the most specific and sensitive biomarker. Both saliva and serum can be used as a biomarker for detection of any disease. Resistin is one such newly recognized marker having a potent biomarker quality. Recently, obesity has emerged as one of the risk indicators of periodontal diseases. Several studies are available in literature associating resistin to insulin resistance and diabetes mellitus, the role remains controversial. Resistin could be one such marker that could provide a link among the periodontitis-obesity. There are very few studies available in the literature comparing resistin and periodontitis, but the role of resistin remains controversial. Hence, with this background, the aim of this study was to correlate the serum and saliva resistin levels and its association in obese individuals with chronic periodontitis. To compare and correlate the level of resistin in saliva and serum of healthy obese individuals and obese patients with periodontitis. Thirty subjects were selected from the department who had come for the treatment. Written informed consent was taken from all the participants before the start of the study and was divided into two groups i.e., Group I comprising 15 obese individuals with healthy gingiva (control group) and Group II comprising 15 obese individuals with chronic moderate periodontitis (periodontitis group). Ethical clearance was taken from the institution before the start of the study. Systemically healthy obese individuals with moderate periodontitis (Group II) showing the presence of more than 30% of sites with clinical attachment level >3 mm measured with a Williams graduated periodontal probe. Medical and dental histories of the subjects were determined. Body mass index (BMI) was determined. Anthropometric measurements included weight (kg) and height (m) of the patients to calculate the BMI (weight divided by the square of height, kg/m2 ). Obesity is defined as BMI ≥30, overweight is defined as BMI 25-29.9, and normal weight is defined as BMI 20-24.9 kg/m2 . The recording of all the measurements was done before the collection of saliva and serum sample. Participants were instructed not to eat, drink, and chew gum for at least 30 minutes before the collection of saliva. The method of collecting the whole saliva was by unstimulated passive drool. Blood samples were collected from the antecubital vein in the morning and were stored in a deep freezer. Resistin was examined with the use of an enzyme-linked immunosorbent assay kit. Pearson's correlation test was used to determine the correlation of clinical parameters with that of resistin in Group II. Resistin was detected in the serum and saliva of all patients. The mean values of the resistin were expressed as mean ± standard deviation [Table 1]. The highest resistin levels were seen in the serum and saliva of Group II. Intergroup comparisons of the clinical and biochemical parameters are summarized in [Table 2]. Statistically significant differences were observed. Chronic periodontitis is a low-grade infection which is characterized by infiltration of the inflammatory cells within the periodontal tissues that will act as a source of production for resistin., Lipopolysaccharides (LPSs) produced by periodontal pathogens are shown to induce the resistin gene in macrophages by a cascade involving the production of proinflammatory mediators thus causing the destruction of periodontal tissues. Resistin is a recently identified adipocyte-derived hormone that has been shown to play a substantial role in the development of insulin resistance. It was hypothesized that resistin may be one of the links between obesity, insulin resistance, and diabetes in rodents. Measurement of resistin in saliva is noninvasive, simple which could contribute to the explanation of the physiology and pathological role of resistin. Hence, the aim of this study was to evaluate the level of resistin in saliva and serum of obese individuals with and without periodontitis. 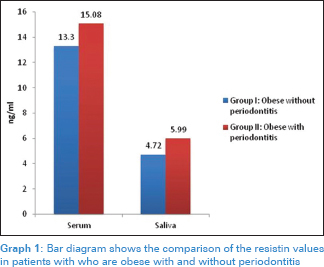 The intragroup comparison indicated a higher mean level of resistin in Group II when compared to Group I [Table 1] [Graph 1] and Pearson's correlation revealed a positive correlation between serum and salivary resistin in obese patients with periodontitis [Table 2], Graphs 2 and 3]. This increase in resistin levels in patients with periodontitis could be attributed to the fact that resistin is mainly expressed from polymorphonuclear leukocytes and macrophages in inflammatory conditions in periodontitis. The other reason could be that added stimulation of LPS releases resistin by putative periodontal pathogens such as Porphyromonas gingivalis. The findings in this study are in accordance with the studies conducted by Furugen et al. and Saito and Shimazaki where resistin level was increased in obese patients with chronic periodontitis. Contradictory results were also obtained in other studies such as Devanoorkar et al. and Al-Zahrani et al. which failed to find a significant difference in serum resistin levels between lean healthy and obese individuals with and without periodontitis. The mean values of gingival index scores and clinical attachment level were found to be higher in Group II when compared to Group I and Pearson's correlation test showed a positive correlation between resistin levels and periodontal parameters [Table 3]. This implies that both inflammatory and tissue breakdown parameters were positively associated in Group II (obese individuals with chronic periodontitis). Several studies have found a significant association between obesity and resistin showing the higher level of resistin in obese individuals when compared to lean subjects. Obesity results in a state of low-grade infection resulting in the release of proinflammatory mediators that can cause the destruction of the tissues. In this study, the increase in the serum and salivary resistin level in obese patients with periodontitis could be enhanced by the preexisting active inflammation (chronic periodontitis). The possible causal relationship between obesity and periodontitis may be that adipose tissue secretes a variety of cytokines and hormones that are involved in inflammatory processes, pointing toward similar pathways involved in the pathophysiology of obesity and periodontitis. In this study, there was a positive correlation in the level of serum and salivary resistin in obese individuals with chronic periodontitis contributing to the knowledge of the role of resistin as a potential mediator linking obesity and periodontal disease. Hence, it can be concluded that resistin probably may bear similar features of a proinflammatory cytokine and could play a role in inflammatory diseases like periodontitis. Very few studies are available in the literature comparing resistin and periodontitis. Within the limitations of this study, it can be concluded that there is a significant positive correlation between resistin, obesity, and chronic periodontitis. However, further longitudinal studies need to be conducted to verify a potential causal relationship linking obesity, resistin, and periodontitis. Diaz-Romero RM, Ovadía R. Diabetes and periodontal disease: A bidirectional relationship. Med Biol 2007;14:6-9. Devanoorkar A, Kathariya R, Guttiganur N, Gopalakrishnan D, Bagchi P. Resistin: A potential biomarker for periodontitis influenced diabetes mellitus and diabetes induced periodontitis. Dis Markers 2014;2014:930206. Teles FR, Teles RP, Martin L, Socransky SS, Haffajee AD. Relationships among interleukin-6, tumor necrosis factor-a, adipokines, Vitamin D, and chronic periodontitis. J Periodontol 2012;83:1183-91. Gokhale NH, Acharya AB, Patil VS, Trivedi DJ, Setty S, Thakur SL. Resistin levels in gingival crevicular fluid of patients with chronic periodontitis and type 2 diabetes mellitus. J Periodontol 2014;85:610-7. Saito T, Shimazaki Y. Metabolic disorders related to obesity and periodontal disease. Periodontol 2000 2007;43:254-66. Vozarova de Courten B, Degawa-Yamauchi M, Considine RV, Tataranni PA. High serum resistin is associated with an increase in adiposity but not a worsening of insulin resistance in Pima Indians. Diabetes 2004;53:1279-84. Azuma K, Katsukawa F, Oguchi S, Murata M, Yamazaki H, Shimada A, et al. Correlation between serum resistin level and adiposity in obese individuals. Obes Res 2003;11:997-1001. Saito T, Yamaguchi N, Shimazaki Y, Hayashida H, Yonemoto K, Doi Y, et al. Serum levels of resistin and adiponectin in women with periodontitis: The Hisayama study. J Dent Res 2008;87:319-22. Furugen R, Hayashida H, Yamaguchi N, Yoshihara A, Ogawa H, Miyazaki H, et al. The relationship between periodontal condition and serum levels of resistin and adiponectin in elderly Japanese. J Periodontal Res 2008;43:556-62. Genco RJ, Grossi SG, Ho A, Nishimura F, Murayama Y. A proposed model linking inflammation to obesity, diabetes, and periodontal infections. J Periodontol 2005;76 11 Suppl: 2075-84. Shimomura I, Funahashi T, Takahashi M, Maeda K, Kotani K, Nakamura T, et al. Enhanced expression of PAI-1 in visceral fat: Possible contributor to vascular disease in obesity. Nat Med 1996;2:800-3. Saito T, Shimazaki Y, Kiyohara Y, Kato I, Kubo M, Iida M, et al. The severity of periodontal disease is associated with the development of glucose intolerance in non-diabetics: The Hisayama study. J Dent Res 2004;83:485-90.